If you've been reading AA this week, one of the major stories we've followed is the precipitous nosedive into hysterical absurdity that has been the live daytime episodes of SportsCenter and their futile quest to analyze the Chicago Blackhawks. After ignoring the NHL for so long, ESPN has scrambled to try to find some way to talk about the Blackhawks' point streak. The majority of the time, this has devolved into insipid and meaningless debates about which streak is better – the Blackhawks' point streak or the winning streak of the Miami Heat? We've seen everyone from Stephen A. Smith to Seth Greenberg to Chris Broussard try to answer that question to mind-boggling results, including Broussard's argument that "basketball is a better sport." Today, ESPN went one step further by breaking down both the Heat and the Blackhawks in tandem with Kurt Rambis and Barry Melrose going back and forth on the strengths and weaknesses of the two teams. The segment was actually quite informative… until ESPN couldn't resist bringing us a few laughs at their own expense. SportsCenter asked the question on every sports fan's mind – which would be the bigger blowout: Chicago over Miami in hockey or Miami over Chicago in basketball? 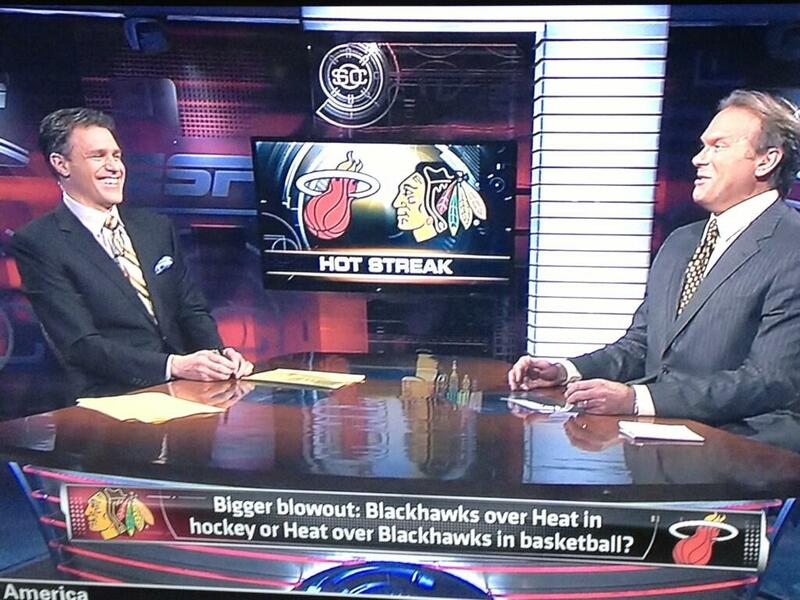 With SportsCenter asking such fantastical, goofy debate questions, we're finding the most insane and hysterical ways ESPN can try to compare the Blackhawks vs Heat next! It's an absurd embrace of debate for the ages!